On October 1, 2016, I will release my second regional book about the history of the livestock business in Centralia and Central Missouri. The forthcoming book includes numerous stories about old-time Centralia businesses and citizens. 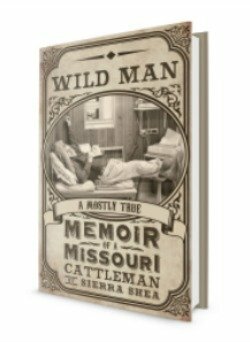 Short excerpts from the book are being published in serial form exclusively in The Centralia Guard, The Cattleman’s Advocate and here on my blog. To date, the title of the book has not yet been released! In 1957, L.W. Angell, Jr. purchased the recently closed Centralia Livestock Auction barn. For a short time, he tried to run the auction barn on his own, but it didn’t work. At the time, he was a partner in livestock auctions in Mexico and Columbia, too. The three barns proved to be too close together, and L.W. became his own competition. In 1958, L.W. started a new venture called “Central Hog Buyers.” In Boone County in the late 1950s, all the farmers in the area had hogs on their farms. The operation size and feel was similar to the sheep business. It was the same on farms across the country. L.W. realized that there was a need for some one to buy, sort and group up the small groups of hogs owned by local farmers. This would get the small groups of hogs from each farm into uniform groups of large enough size for the packers to purchase and kill. At that time, both sides of the industry needed a “middle man” to function more efficiently. Luther, Buddy and I sat in the office of the old Centralia sale barn while Buddy told me how L.W. turned the building into the Hog Buying Station. Buddy was relaxed, his legs were crossed and he reclined slightly. He sat in a metal chair that looked like it had been picked up at a garage sale or used office supply store. Central Hog Buyers bought hogs from the farmers and resold them in uniform groups to the different packers. The small margin was their paycheck for the services of hauling, sorting, weighing and selling. The system benefited everyone. The local farmers didn’t need to haul their hogs to the terminal markets anymore. They also didn’t have to sort, haul and own enough hogs to make a full semi load. They did business locally with Central Hog Buyers and then the Angell family dealt with a variety of different packing plants to market the larger groups of hogs. Buddy explained their business to me, saying, “Me and Luther would drive out to all the farms and pick up the fat hogs from area farmers. Once we got them to the hog barn, we sorted and weighed everything until we had full loads that matched the descriptions of what the different packers wanted. It was a real family business! 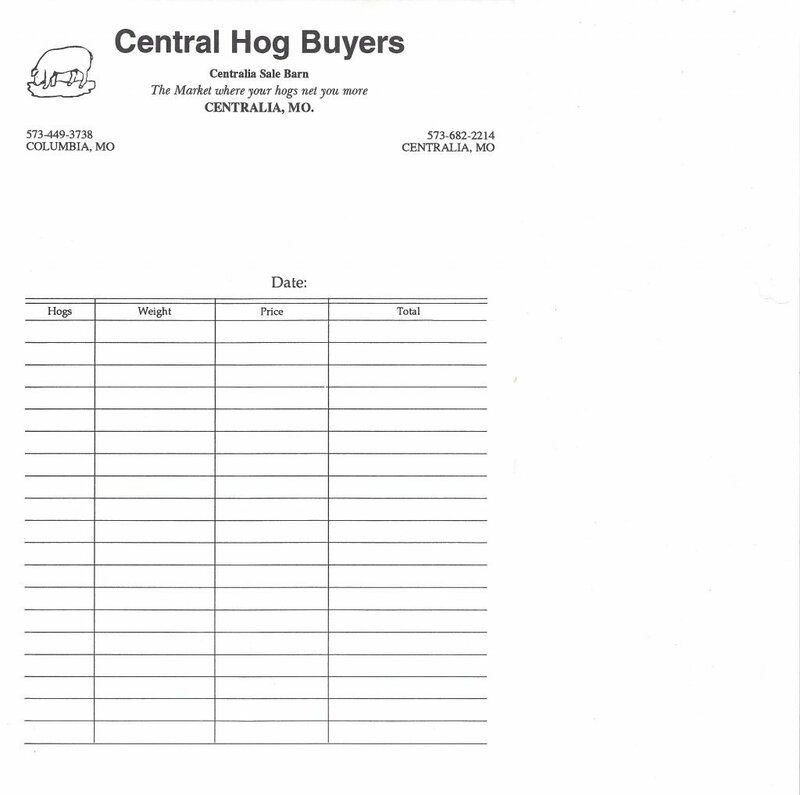 An example of the paperwork filed at Central Hog Buyers. 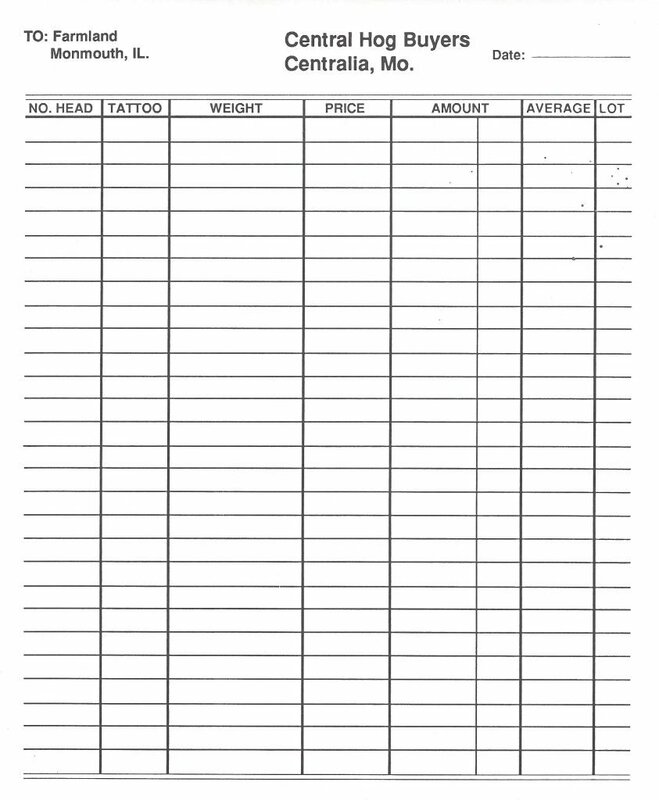 A second example of paperwork from the old family business. 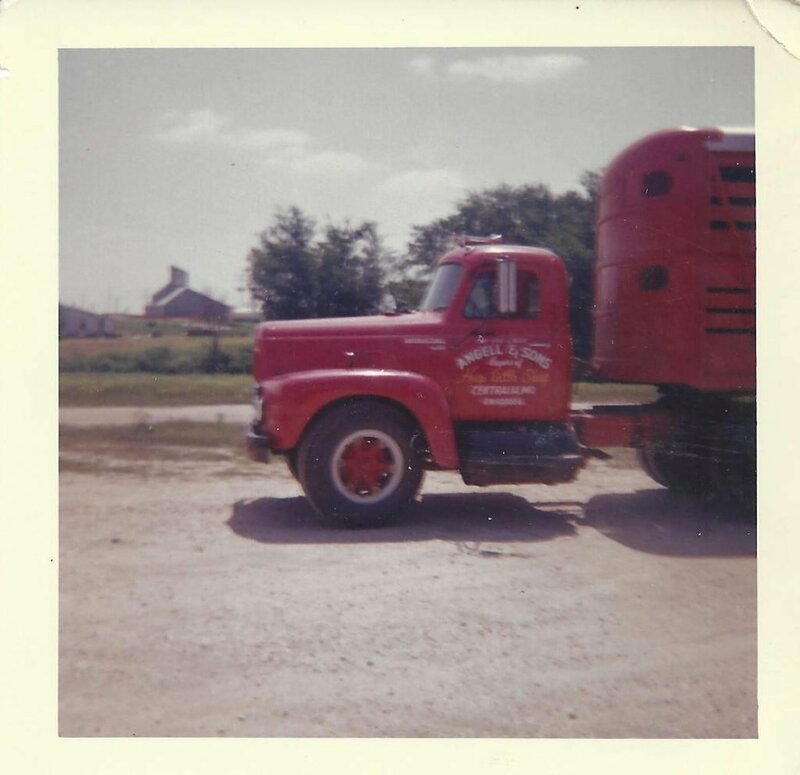 This was one of three red International trucks purchased by Angell and Sons to help facilitate picking up hogs all over Boone and Audrain Counties. I vividly remember taking hogs there to sell, and the most exciting part was having a cold bottle of soda in the office.